Drew Monti never had a chance. His parents, Darrin and Molly, met at Buffalo Raceway and his dad was a Standardbred trainer. Based on that, it should come as no surprise that the 23-year old became involved in harness racing. An only child, Monti is one of the young bucks who can hopefully steer harness racing towards a bright future. The kid is off to a good start. He was named Driver of the Year at the 2018 Buffalo Raceway meet which ended in July and is now working his craft at Batavia Downs, 35 miles east. At Buffalo, his horses won over $706,000 in purses and, thus far, he has added over $357,000 at Batavia. Although his dad is a trainer, Monti has no desire to follow in his footsteps — at least for now. While he drives for other trainers, his dad has eight horses, so the father-son tandem will continue to be heard from going forward. 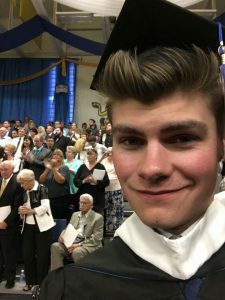 Drew Monti graduated from Canisius College with a degree in economics (photo courtesy of Drew Monti). Unlike many, Monti has something to fall back on. After graduating from Canisius High School, Monti stayed in Buffalo and earned a degree in economics from Canisius College. Buffalo is a unique town. Known for its gray skies and snow, those that are from there love it and many struggle to get Buffalo out of their system. I know that firsthand as a native Western New Yorker who moved away, but thinks of his homeland often. Monti knows if he wants to make big money in harness racing, he might have to relocate. The Buffalo-Batavia circuit runs from January to December, with approximately 140 racing days, but purses are on the small side. The opens run for $10,000, with many of the condition races going for considerably less. Monti has raced at Yonkers and the Meadowlands and he knows that the day might come where he has to make a decision. Drivers do more than drive horses; they drive their cars all over to race. It is not uncommon to see drivers race at Monticello in the afternoon before heading to Yonkers in the evening and then Harrah’s Philadelphia the next day. Monti is no exception. He’ll drive at Buffalo on a Saturday evening and, then, drive three-plus hours to race at Vernon the next afternoon. Buffalo is not very close to many tracks, which makes things problematic. But, at 23, time is on his side. In 2019, it looks like Buffalo will scale back to a 66-day race season. When the season begins at the end of January, it will race two days a week. In April, that becomes three days. While dates are not set in stone, it figures to be Wednesday and Saturday and then Wednesday, Friday and Saturday. This scenario could allow Monti an opportunity to drive at Yonkers on Monday and Tuesday or even The Meadows, which is near Pittsburgh. With 183 wins and over $1 million in purses, Monti is making money. The quick math tells you that a driver with $1.1 million in earnings is grossing $55,000 and with two-plus months left at Batavia, Monti could be inching close to perhaps $80,000 in gross income. The top drivers are in the $400K to $600K range. But, because he still lives at home with mom and dad, he’s stashing more money away than some of his fellow drivers. Like many kids, Monti grew up playing sports. He liked baseball and he started helping both his dad and grandfather with their horses. His dad got out of the business for a while, but eventually got back in. Monti got his grooming license at age 14 and then, at 16, got a qualifying license that allowed him to drive at fairs. He was thinking of going full-time even then, but dad had another plan. Because Canisius College is located in Buffalo, Monti was able to attend classes in the morning and early afternoon and help at the track afterwards. He jogged many horses and did some racing. It took some juggling, but he was able to pull it off. Upon graduation, Monti decided to devote himself full-time to racing. His first win came in April 2013 with Mr. Grin and he has gone forward from there. He has competed in all sorts of races and has done some driving for Linda Toscano in the New York Sire Stakes. Toscano was inducted into the Harness Racing Hall of Fame this summer. As a now-experienced driver, Monti has opinions about the sport. He thinks pacers are easier to drive, but likes trotters more. “Trotters are more high-strung than pacers, but I like driving them. When they’re going well, there’s nothing like it. “You try to get to know each horse. That can be tough sometimes as a catch driver, because each horse is different. The more experience you get, the easier it is,” Monti said. Though his home tracks are Buffalo and Batavia, they are not his favorites. He’s also raced at Vernon and Tioga Downs. He has also raced at Monticello and, as mentioned, Yonkers. His favorite is Mohawk Park north of the border in Campbellsville, Ontario. The only track in New York he hasn’t raced at is Saratoga Casino Hotel. Drew Monti celebrates the 1,000th win of his young career (photo courtesy of Drew Monti). I did mention that if he made Saratoga his home track, he could race there and drive to Yonkers, Monticello, the Meadowlands, Tioga, Vernon and Harrah’s. With the exception of Harrah’s, all of the tracks are no more than three hours away and give him plenty of options to increase his earnings. And, with the Meadowlands poised to finally get some funding from the New Jersey state legislature, there’s a chance that the Meadowlands may add racing days. If that happens, the track will need more drivers. Monti knows that all is not well with the sport. When asked about the post drags (when 0 minutes to post sometimes lasts for 6 to 10 minutes), he was philosophical. Drugs are also part of the sport; some trainers get caught, some don’t use them, while others use them but don’t get caught. With sports betting now available in New York and Delaware, Monti is hoping that New York will eventually pass legislation to allow it and that some of the revenue spills over to both thoroughbred and harness racing. When he’s away from the track, Monti spends time with his girlfriend, Jami, who like him, grew up in the sport — so she understands that when many couples are on Saturday dates, her guy is working and racing. He also enjoys fishing, movies and live music, citing Dave Matthews as a favorite. He also has a dog which, like a horse, needs to be walked and attended to. If you follow harness racing, you know who the big names are. In driving, it’s Brian Sears, Aaron Merriman, Jason Bartlett, Yannick Gingras, Dave Miller, Scott Zeron, Tim Tetrick and others. 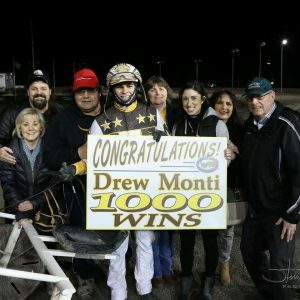 Could Drew Monti eventually be one of those household names? He has the talent and at 23 years of age, time is definitely on his side. It might be a good bet to bet on Monti going forward.